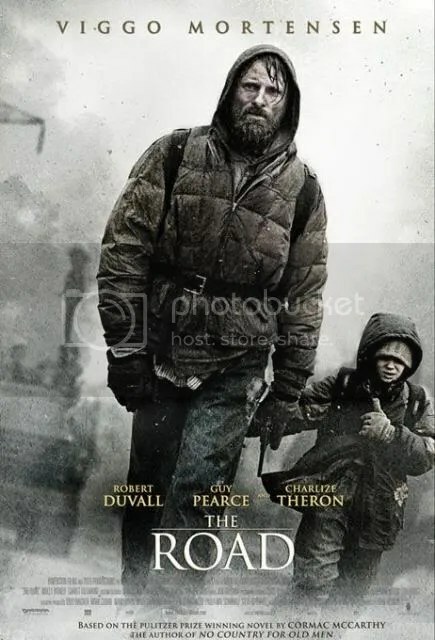 The Road is a post-apocalyptic tale of a man and his son trying to survive by any means possible. Heading south in an attempt to get to the coast in what is a very lonely, scary and emotional journey for both the man and boy. A film like this really does make you sit back and evaluate all the little things in life that you take for granted and don’t really realise how good you have it. Having to watch the man and boy struggle to survive checking houses to see if anything was left to eat, taking shelter and even clothes and shoes from people who had died or left them in the house was really difficult to understand. In the sense that they had to do this to even survive, is a terrifying image. While on their trek towards the coast, they had to be careful of other human’s who had survived as a break out of cannibalism took place in the difficult times so they could not get caught by those people. In one incident this brought a test to the man who ended up shooting a man dead as he threaten to kill the boy. I found it interesting that the character’s were not given names, although I have to admit that I did not really realise this until I checked IMDB after I’d seen the film. We just know them as man and boy (I think I heard the old man call him Sean though). This showing that their names were not important but their relationship and keeping each other going was key to the story. The boy was born after the incident which wiped out most of the population, so he has never know any different in the world other than death. The man has nightmares which are shown as flashbacks to life before and his wife. He tells the boy stories about how things were in the past, all of which seem strange to him. The woman made a decision to commit suicide as she did not believe they would survive another winter, in which was a totally heartbreaking scene because of Viggo Mortensen’s performance. An important part of the man and boy’s story was to do with the gun which ended up having one bullet left which the man had shown the boy what to do if anything happened to him, by placing it in his mouth and pulling the trigger, this gave us even more powerful scenes. A lot of the people who survived committed suicide after so long, when surviving any longer was practically impossible. This brings a thinking point of, if you were in that situation would you choose to kill yourself before anyone got to you? The performances from both Viggo Mortensen and Kodi Smit-McPhee were just incredible, the bond they appeared to have with one another really looked fantastic on the screen and made scenes so brilliant. Viggo really does just impress more and more each time you see him in a new role, this was a very emotional role which involved a lot of tears which was so heart wrenching to watch. You really felt for him and loved him for protecting his son. Kodi was amazing as well holding the scene’s with Viggo and bringing the innocence of a child to certain scenes. I found this film extremely heart wrenching and breaking throughout for different reasons, mainly being the relationship between the man and boy . . . a father and son in a fight for survival. This is definitely a film to see, brilliant performances. Oscar nominations? I would think so. This is one of those movies that won’t get mentioned come award time, but I really wish it would. It really speaks to the core of what it means to endure, and makes every audience member question just how long they could last before finally giving up. Great review! You’ve really summed up the bleak beauty of the film! It really does get in your head making you think how long you would last before you gave up hope and wanted it to all end. I liked the keep carrying the fire parts which were done to keep the boy going and his hope alive. Great review, it looks like you drew a lot of similar conclusions to me. One of the key points, as you put it about the boy has “never know any different in the world other than death” this is really important to the boys out look and their relationship. I agree it really should be up for awards. If nothing else best actor. If Avatar gets a best picture nomination and this is overlooked I will lose what little faith I have in the academy! Yeah with the 10 nominations this year it stands more of chance but I have thought that for quite a lot of different films. I guess we will just have to wait and see. An excellent review. I’ve made up my mind to watch the movie. I agree with you – Such movies make us reflect upon all that we take for granted – there are a great many things that we would shirk from today (vanity/hygiene) but when our survival is threatened, we probably wouldn’t think twice before doing all that could help us live another day. Very good points about the vanity/hygiene Shafali.